Below are some calendars with pictures of Canada, or Canadian themes. O CANADA! The true north, strong and free. Canadians take great pride in their nation's varied landscapes. From the great white northern tundra to colorful coniferous autumns and rolling prairies, Canada is quite the sight! 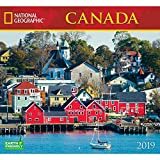 National Geographic Canada 2019 is a breath of fresh air with majestic, vivid photographs. Each outstanding image in this bilingual English/French calendar is accompanied by a spacious grid with moon phases and international holidays. Locations included this year: Lake Louise, Banff National Park, Alberta; Aurora Borealis, Yellowknife, Northwest Territories; Rose Blanche Lighthouse, Newfoundland and Labrador; Saint Joseph's Oratory, Montreal, Quebec; Mount Cheam, Fraser Valley, British Columbia; Hudson Bay; Rocky Mountains, Waterton Lakes National Park, Alberta; Gaspe Peninsula, Quebec; Agawa Canyon, Ontario; St. John's, Newfoundland and Labrador; North Wiltshire, Price Edward Island; Lunenberg, Nova Scotia. National Geographic supports vital work in conservation, research, exploration, and education. This calendar includes a 3-year at-a-glance page and is earth friendly, printed with soya-based inks on FSC certified paper. 13 x 12 inches (opens to 13 x 24 inches). 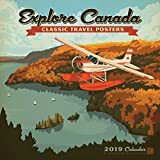 Explore Canada 2019 celebrates Canada's idyllic scenery with style. Inspired by vintage poster art from the late 1800s to the mid-1900s, these original posters were created by the Anderson Design Group to spotlight great travel destinations and points of interest. Each poster highlights an iconic Canadian landscape. Striking perspectives created with vibrant colors and well-crafted lettering add to the retro vibe of these posters. 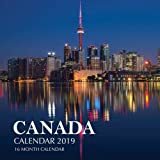 Explore Canada is a twelve month calendar with colorful grids, international holidays, and moon phases. There are sections at the back of the calendar for emergency contact information and birthdays/anniversaries and a full-page 3-year at-a-glance. Earth friendly, printed with soya-based inks on FSC certified paper. 12 x 12 inches (opens to 12 x 24 inches). Fill your upcoming 2019, with 16 months of Canada all year round. This beautiful calendar contains 16 months and 3 mini 2018, 2019, and 2020 year calendars. 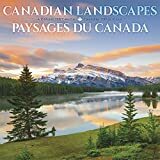 The bilingual 2019 Canadian Landscapes/Paysages du Canada wall calendar is teeming with astonishing images of snow-covered mountains and picture-perfect coastlinesthe paradise youve been dreaming about. You can almost step right into these stunning Canada scenes. Sixteen-month wall calendars include each month in 2019 as well as the last four months of 2018, printed on paper certified by the Forest Stewardship Council.